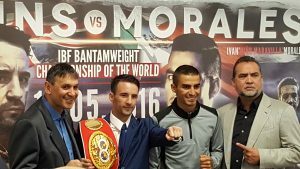 This Saturday, Ice Arena Wales will play host to the IBF World Title fight between Bristol’s Lee Haskins and Mexico’s Ivan Morales. Supported by an excellent undercard of competitive contests. 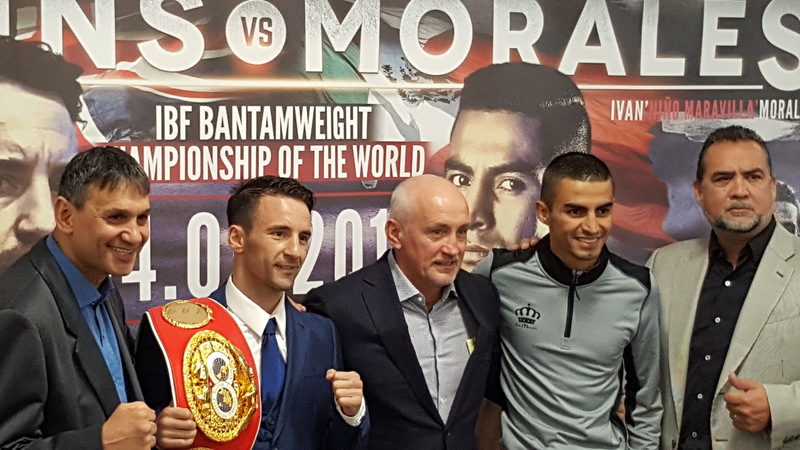 Today at the Ice Arena, Barry McGuigan (of Cyclone Promotions) along with Chris Sanigar (of Sanigar Promotions) and Robert Ortiz (Of Golden Boy Promotions) hosted the Final press conference. 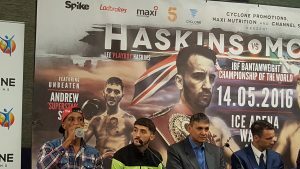 Fighters in attendance were: IBF Bantamweight champion Lee Haskins and challenger Ivan Morales; cruiserweights Craig Kennedy and Joel Tambwe Djeko and flyweights Andrew Selby and Louis Norman. Here is what the fighters involved, at the top of the card, had to say. Let’s get it on. Only two days away, until the big fight, and I can’t wait. I think it’ll be an explosive night. Me and Ivan will be a great fight and the other title fights will be great fights. It’s going to be one of those fights, that you don’t want to miss. I want to put on a great performance for Cyclone Promotions and hopefully, we can get another show like this soon after. I want to thank everyone for the support and come Saturday it’ll be a great night. First of all, I’m very grateful to be here. I want to thank Cyclone Promotions and Golden Boy Promotions. To Lee – Thank You for the opportunity. I want to tell you all to enjoy the fight. 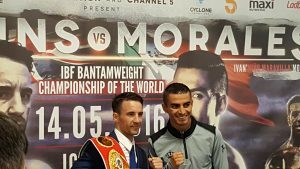 It’s going to be a very, very good fight and you don’t want to miss it. It’s at that point now, where I just want to let my hands do the talking. Thankfully, Djeko is here and I want to thank him and his team for actually turning up, which is an achievement in itself. Fingers crossed it goes to plan, the camp has gone well, I’ve been injury free. The better the opponent, the better I perform. I know Djeko is coming to fight and it makes for a very, very good fight. I’m thankful to Cyclone Promotions and my managers the Sanigars. I want to give a shout-out to one of my trainers Tony Richards, it’s been a long camp and he’s been with me from the beginning. He (Djeko) hasn’t come all this way to lose. Being 6’6″, he’s got punch power in both hands it could definitely be one of my toughest fights. The way I’ve prepared physically, and mentally, I think that I’ll make quite light work out of it. I’m in the best place I’ve been, in my career, to date. I come from Belguim, I’m happy that I’m here for this event. Big thanks to Craig Kennedy for inviting me to fight. 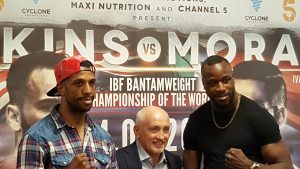 For Saturday, I’m going to be ready for War, cos this is the War for the IBF International belt. After War, we going to be friends – no problem. I’m going to keep it short and sweet cos I’m not very good at this (public speaking). I’m a very good boxer and I’ll show you that on Saturday. 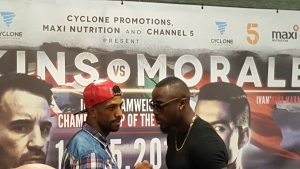 I want to thank Cyclone Promotions and all of you for coming. 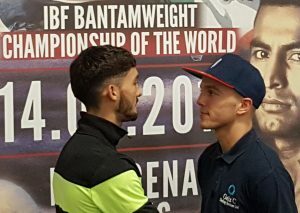 You’ll see the best Andrew Selby on Saturday. I’ve done twelve rounds sparring, over and over, it’s just like a habit to me now. I’m ready for war, over twelve rounds, you’ll see a good fight on Saturday. It’s finally here. I can’t wait for Saturday, it’s the biggest title I’ve fought for so far. 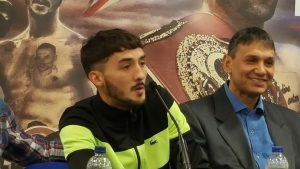 Andrew Selby is a tremendous talent and I really can’t wait to beat Andrew Selby for the British title in his hometown. Who would’ve thought Leicester would’ve won the Premier League. So, let’s prove that I’m the new British champion.